Our logo on a die-cut sticker. Fits any purpose. Get it, stick it. License: The logo of the FSFE must never be used in a way that could be understood as endorsing certain activities, home pages, products or entities without prior consent of the FSFE. This leaflet compares the use of Free Software to the use of screws and screwdrivers. This analogy was chosen to help audiences with a non-technical background to understand the four freedoms of software. The leaflet is generally well received at the FSFE's booths. Context information: What is Free Software? After Snowden's revelations about the mass surveillance programmes by the NSA and other Western security agencies, there is a big interest by the people in reclaiming their privacy as well as to secure their communication. To help people with their email communication, we made a leaflet that explains the problems of email security and how to solve them by using GnuPG for email encryption. In addition, this leaflet explicitly explains what is a backdoor and why software for security measures needs to be Free Software. This is a leaflet about Digital Restriction Management and its menace to our citizens' rights, our digital heritage, our creativity and our privacy. Since recent developments in HTML5 a topic that is more relevant than ever. This is a leaflet about F-Droid, a Free Software App Repository for Android and Android-based custom-ROMs like Replicant. This leaflet explains the installation and use of F-Droid - the Free App store without Ads, Spying, Tracking or the need of a Google account. It also includes some recommendations of pretty good Free Software Apps for you to use. This small-sized sticker fits perfectly on the back of your Android device. The flyer of our I love Free Software campaign. The flyer is two-sided: One side with the IloveFS-heart (same as in the IloveFS-poster). The other side is showing the date (Valentine's Day) and the URL of the IloveFS-campaign. A postcard to be used by you with the slogan "I love Free Software - ... but I love YOU more!" The poster of our I love Free Software campaign. The poster is two-sided. On the other side is our noCloud-poster. Hand out these balloons on conferences, parties or decorate your local hackerspace! The balloons are printed on both sides. A postcard to let people know about their online-reality that says "There is no cloud just other people's computers"
A nice poster with the slogan "There is no cloud, just other people's computers". The poster is two-sided. On the other side is our IloveFS-poster. After eight years of running our Document Freedom Day campaign, in 2016 the FSFE handed over the organisation of the campaign to the Digital Freedom Foundation. We still have, however, some stock material that we send out. It will not be reproduced. Get yours before it is too late. The poster of our Document Freedom Day campaign. The poster is two-sided with one side in English only and the other side in multiple languages. A3 & A2; one side English, other side multi-lingual. A poster to explain how Open Standards are crucial for the interoperability of data between different software programs as well as for the longevity of documents and the sustainability of data. Two sided poster in English and French. 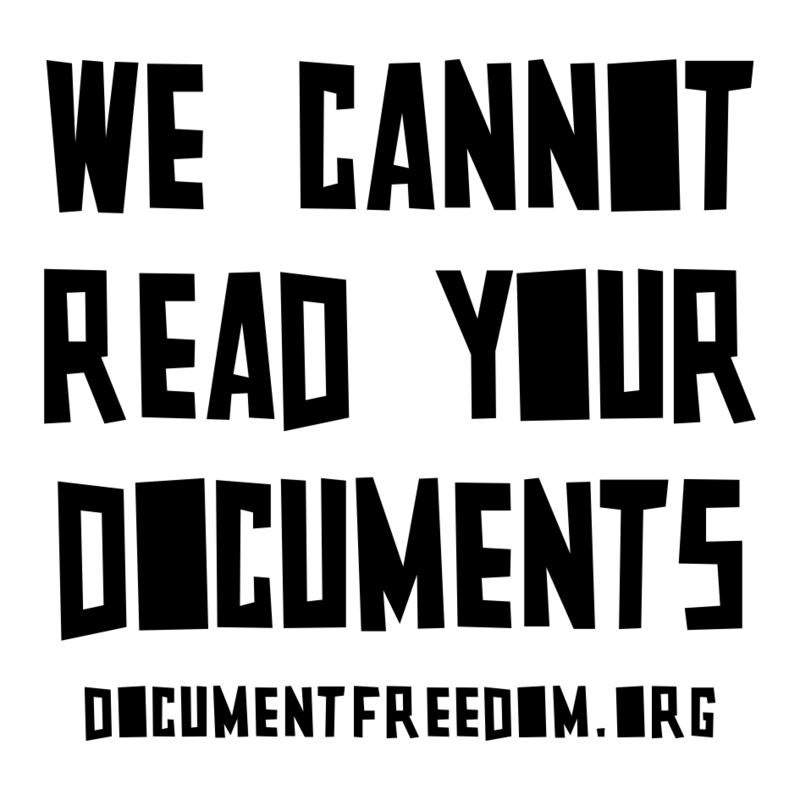 The "We cannot read your documents" sticker used to be part of our Document Freedom Day campaign. The slogan highlights the problem in the use of proprietary file formats, as they exclude all people not using the same proprietary software from reading of their documents.